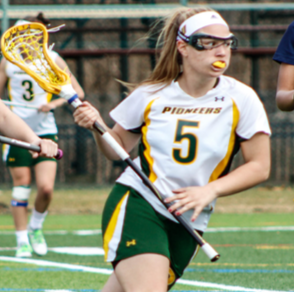 The fourth ranked Pioneer women’s lacrosse team fell to the third ranked Le Moyne College 10-6 in a non-conference match-up March 4 at the Bethpage Federal Credit Union Stadium. The Pioneers came out strong during the first half, outscoring the Dolphins 4-3. A 5-0 run by Le Moyne in the middle of the second half gave them a five-point advantage over the home team. Senior attacker Connor Bird led the Pioneer offense with two goals and one assist. Sophomore attacker Morgan Lanning scored a goal during the first half to bring the Pioneers in the lead. Red shirt senior attacker Alexis Newman and senior attacker Stefanie Vagelatos each recorded two points with one goal and one assist. On the defensive end, senior Cara Douglas led the Pioneers by collecting three ground balls and causing two turnovers, senior Brianna Gibbons and freshman Paige Sherlock both collected two groundballs. Junior goalkeeper Olivia Kirk was able to save six shots for the home team. 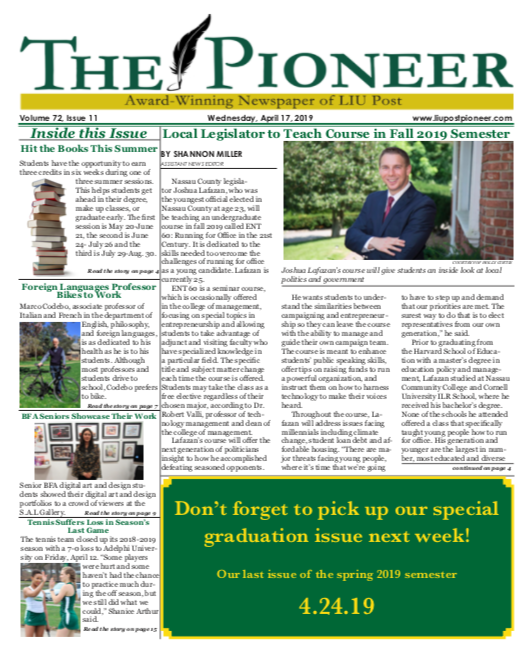 The Pioneers are now 1-1 on their season. They will return to action March 8 against Philadelphia University at the Bethpage Federal Credit Union Stadium at 3 pm.